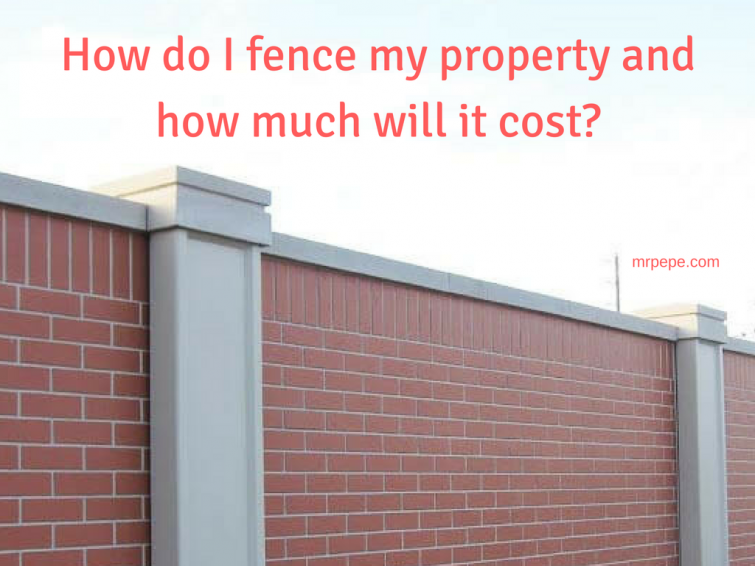 Guide: How do I fence my property and how much will it cost? If you have just purchased a plot (or plots) of land, and you are thinking of what your next steps are, congratulations on your purchase! 2018 will be your best year for investments so far, if you can just plan adequately to secure assets (things that gain value over time, and put more money in your pocket) rather than liabilities (things that lose value over time, and remove money from your pocket). For example, your plot of land that you have just purchased (or are about to purchase) is an asset. Your vehicle is a liability. For a deeper understanding of what assets and liabilities are, I would suggest that you read Rich Dad, Poor Dad by Robert Kiyosaki. You can get it from a bookstore near you, or on Amazon. These steps would guide you on all that you need to fence and gate your property, including paper work and materials. This should serve as a guide so that when your contractor gives you an estimate, you can make an informed decision. In this case, all materials and dimensions used will consider a plot of land measuring 18m x 36m (60 feet x 120feet). Before you start doing any work, you will need to cut and remove any bushes or shrubs from the property. This is the first operation to be carried out after the beacons of the plot have been set by the land surveyor, and it prepares the site for excavation and other site activities. How much the workers charge you depends on the size of the plot, the people performing it and the equipment they will need to use. You should expect to pay anything from N30,000 naira and above for a full plot. 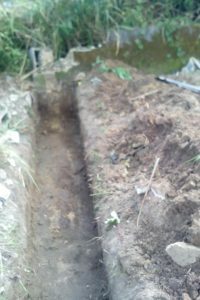 Excavation involves digging the soil where the foundation of the fence/building will be built. The cost depends on the size of the plot, the depth to be excavated, the equipment to be used and the people performing it. We will calculate the cost of excavating a plot of land 18m x36m (60 x 120ft). The rate of excavation ranges from 750naira per cubic metres to 900naira per cubic metres. 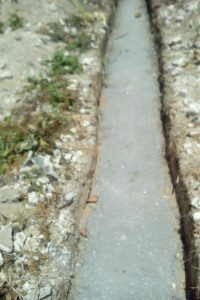 Blinding involves thoroughly mixing a layer of sand, granite and cement to form concrete, which is then poured on the ground after the excavation to provide a level surface for the fence/foundation to sit on. We are going to calculate the materials needed for blinding such as the cement, sand and granite, so that you are not misled by your contractor. Most times, cement, sand and granite are used in the ratio 1 : 2 : 4. This means 2 headpans of cement to four headpans of sand and eight headpans of granite. You get 2 headpans of cement per bag, so that’s one bag of cement to 4 headpans of sand and eight headpans of granite. Going by this knowledge, it is easy for us to do a calculation of materials needed for blinding a plot of land 18m x36m (60 x120ft). To do this calculation add the sum of the ratio 1+2+4= 7. Divide 1.01/ 0.035 = 29 bags of cement is needed for blinding a plot of land. Cost of cement is N2,700 x 29 = N78,300 . Therefore volume of sand required is = 1.01 x 2 = 2.02 cubic metres. If we take the volume of a tipper as 3.8cubic metres then 2.02/3.8 = 1/2trip of 5tonnes tipper of sand, if one trip of sharp sand cost N15,000 then 1/2trip is N7,500. For the granite use the same ratio of 1 bag of cement to 4 headpans of sand to 8headpans of granite. That is one and half trips(11/2) of granite of 5tonnes tipper. If one trip of 5tonnes of granite cost 30,000 naira then one and half trips will cost 45,000naira. The labour cost for blinding varies but majorly it is 800naira per bag of cement and we have 29bags of cement, labour cost is = 800 x29= N23,200. Total cost for blinding is 78,300+ 7,500 + 45,000 + 23,200 = 154,000 naira only. The next step after the blinding process is the laying of blocks. One of the most popular questions I get from potential property owners is “how many blocks do I need, to get my fence or building completed”? 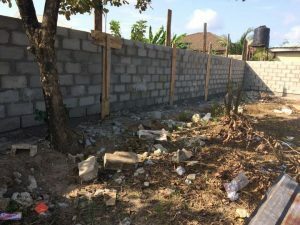 To answer this, I want to guide you through calculating the number of blocks that we are going to use to fence our 1 plot of land, after the clearing, excavation and blinding have been completed. Remember the size of the plot: 18 x 36m (60 x120ft). Some figures to bear in mind. Please write this down, as it will help you with your building calculations in the future. ii) The width of thickness varies – 150mm or 6inches and 225mm or 9inches which are commonly used. Now that we have these parameters, let’s calculate the number of blocks needed for our plot of land. Divide the total perimeter by 0.45m (length of a block) to know the numbers of blocks are needed for one coach/level/course of block. Therefore 232 blocks are needed for one coach/level/course. Remember we have 12 coaches of blocks for a fence, then multiply the number of blocks for each coach above by 12 = 232 x12 = 2784blocks. Number of blocks for 39columns is 39 x12 = 468blocks. Labour cost for laying a block is N60 per block. Total cost for block work =715,400 + 194,400 + 90,000 + 214,620= N1,214,420 naira. Get a gate to protect your property, cost of gate ranges from N100,000 – N1,000,000 naira only. We also need to do the columns (two of them) that would hold the gate. Total cost for gate is N100,000 + N18,000 + N9,000 + N10,800 + N15,000 + N15,000 + N3,000 = N170,800. The Total cost for Fencing a standard plot of land 18m x36m (60 x 120ft) on a dry land with 12coaches/courses is N1,601,470 naira. This cost is applicable assuming that the land is dry. 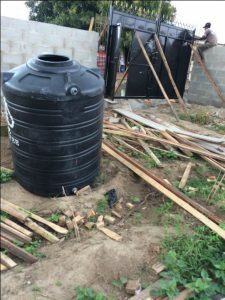 If however the land is on a slope, swampy or waterlogged, the cost will differ as there might be additional costs involved in filling the land. I hope that this give you a place to start from in terms of building your fence, and if you have any questions, feel free to ask them in the comments section. MD/CEO, Samuel Ajose Engineers Ltd, Building Construction and Real Estate Specialist. Good write up, why did you suggest blocks for the columns at 2.7m intervals, why not concrete? Wouldnt the fence give way after some time if ordinary block is used, you didn’t input granite & sand for the 2 gate columns, kindly inform readers that this is a base estimate, the cost of actualisation could be much more. I suggested blocks for the 2.7m interval because my calculation is based on a dry land, if you have a very dry land you can use blocks for the columns at interval of 2.7m and they won’t give way, I have done such fence jobs in Abuja, Benin city, ikorodu in lagos and they are still standing for years now but if you are Fencing in waterlogged or filled lands you must use iron rods and concrete for your columns. The reason I didn’t calculate for sharp sand and granite in the columns for the gate is because it is too little and the one for the blinding will cover up. The sharp sand for the two columns is 0.04 trip and the granite is 0.08trip if you use same method we calculated for blinding. Yes, it is a base estimate for a dry land, the cost will differ with location, nature of soil, topography , type of gate etc. For example we have done some fences on the island in lagos state and the base were all made of concrete , the cost of such fence will be more than that of a dry land as given above. Thanks for your detailed analysis.Can you please send me your contact details? Anyone know any cheaper alternative for example a metal fence after a land survey? For agriculture land purposes. NAIRA. *DURATION OF DELIVERY AFTER ORDER:2DAYS. *TRANSPORTATION COST: DEPENDS ON DISTANCE/ YOUR. NOTE: we deliver our goods to any state and country . For the cement needed in fencing why divide the total blocks by a figure of “50”? My spouse and i felt very thankful that Jordan managed to do his homework with the ideas he acquired through the weblog. It’s not at all simplistic just to continually be offering guides which usually most people may have been making money from. We understand we have the blog owner to appreciate for this. The specific explanations you’ve made, the simple site menu, the friendships your site help instill – it’s got many exceptional, and it’s helping our son in addition to us imagine that the article is brilliant, which is exceedingly vital. Many thanks for all the pieces! I simply wanted to post a brief remark so as to appreciate you for all of the nice tips and hints you are giving at this website. My extensive internet research has now been honored with sensible facts and techniques to share with my close friends. I ‘d admit that we readers actually are undoubtedly blessed to live in a magnificent place with very many brilliant professionals with beneficial tips. I feel rather privileged to have discovered the site and look forward to tons of more cool moments reading here. Thanks once again for everything. Thank you, Emmanuel. This is much appreciated.